With its soft hues and damask print, Annecy is inspired by the wood block style found on a vintage French textile in the Laura Ashley archive. 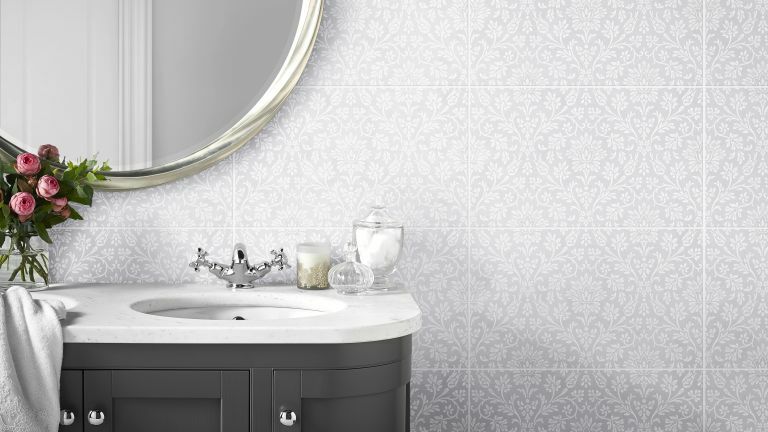 Sure, it's a very traditional tile but the floral motif is in no way twee, and the new colourways (Dove Grey, Powder Grey and Duck Egg) are delicate yet fresh. As part of the new collection, the best selling Mr Jones and Wicker tiles are now available in two new colour ways – Duck Egg and the deep blue Midnight. We love the geometric print of the Mr Jones tiles, and in the new Midnight shade? Dreamy. A first of its kind for Laura Ashley, this new 50 x 50cm large format floor tile has been specially designed to complement new and existing collections through a simplistic, natural look. A gloss finish brings an element of luxury while the inky, swirling effect of oily marble combined with a Natural or Slate White colour way gives the tiles a rustic vibe. To see the entire collection and check out more of the latest tile trends head to www.britishceramictile.com.